Each employee will be given a discount card (new starters will be given a card during training) which they can use at the agreed outlets listed on this page. Please present your card before ordering/purchasing any goods. Discounts are available at the discretion of the outlet and can be removed or amended at any time. Usay will endeavour to keep this page updated with all valid discount agreements, but will not be held accountable should the outlet change the discount offered or remove the discount at short notice. 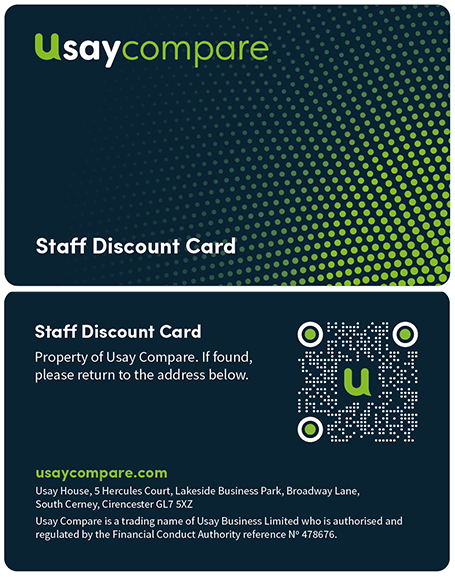 The discount card will remain the property of Usay Business Ltd and should an employee leave the company, they must return their discount card within 7 days of leaving the company. If a card is lost, the cost to replace it will be £2.50 and this money will go to the Usay nominated charity for that year. Usay Compare is not responsible for the content of third-party sites.